The new head of the CIA is a dangerous Christian extremist who believes the U.S. is at war with Islam. Earlier today, the U.S. Senate confirmed Representative Mike Pompeo as the new head of the powerful Central Intelligence Agency (CIA). Pompeo, a Kansas Republican and prominent member of the House Intelligence Committee, is a radical Christian extremist and a sharp critic of Islam who endorses the notion of a “Holy War” between Christians and Muslims, and believes the fight against terrorism is a war between Islam and Christianity. They abhor Christians, and will continue to press against us until we make sure that we pray and stand and fight and make sure that we know that Jesus Christ our savior is truly the only solution for our world. It’s been just under two months since the attacks in Boston, and in those intervening weeks, the silence of Muslim leaders has been deafening. Pompeo went on to suggest that failing to condemn the terrorist attacks made Muslim leaders “potentially complicit” in those attacks. In another anti-Muslim incident earlier this year, Pompeo, using veiled threats and intimidation tactics, forced a mosque located in Kansas to cancel an appearance by a prominent Muslim leader, in part because the speaker was scheduled to appear on the Christian holy day of Good Friday. Amid the fire hose of lunacy that is the Trump transition, however, Pompeo’s extremism has been overlooked. It’s worth pausing to appreciate the fact that America’s CIA will shortly be run by a man who appears to view American foreign policy as a vehicle for holy war. The Washington Post reports Pompeo “is known as one of the more fanatical purveyors of conspiracy theories.” For example, previously Pompeo suggested President Obama might have an “affinity for” radical Islam. 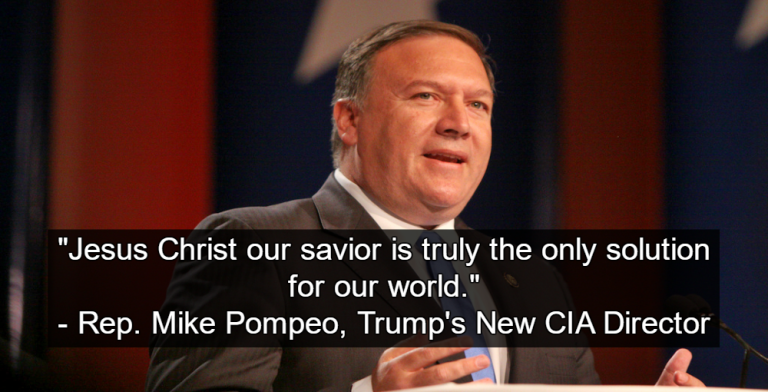 Bottom line: Pompeo is a dangerous Christian extremist. His Holy War mentality is alarming, and completely inappropriate for the Director of the CIA. What Mike Pompeo fails to acknowledge is that Christianity is embedded in the teachings of Islam. Muslims endorse the teachings of Jesus Christ, described as the penultimate prophet and messenger of God.